The Newton Early Childhood Program (NECP), Newton’s only public preschool, hosts its largest school fundraiser of the year starting March 28th. Get ready to bid for great deals on restaurants, summer camps, birthday parties, gym memberships, and more! Over 100 amazing items from across Newton and the Boston area. Auction proceeds will fund education enrichment programs, community-building events, and classroom materials for our city’s youngest learners. Visit NECPPTO.ORG/AUCTION. Bidding ends April 6th at 9:00 pm. Good luck! My name is Sophie Abou-Rizk and I am a recent graduate of Newton North High School who played soccer there for all four years. 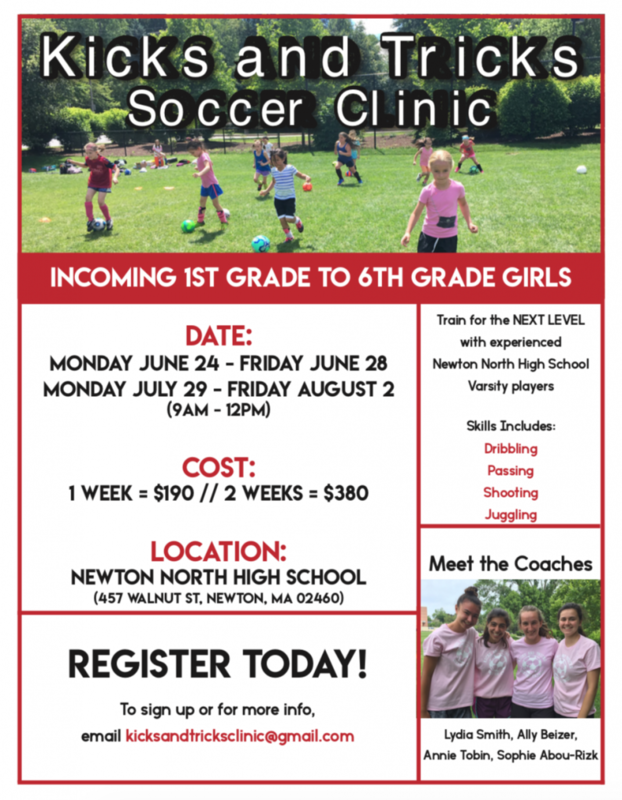 Every summer, three of my varsity teammates and I run and coach a girls soccer clinic: Kicks and Tricks. The past years have been incredible; we’ve met amazing girls, who are motivated and interested in working hard and developing their technical and tactical soccer skills. Kicks and Tricks runs from June 24-28, and July 29-August 2 from 9am to 12pm on the Newton North High School fields and the cost for each week is $180.